UC Santa Cruz is in dire need of student housing. Almost no one living on or off campus would debate that point. But the questions of where and how to build such housing, along with its size and scope, are the subject of impassioned discussion and debate. Above: A rendering of the proposed new family student housing community and child-care facility near the intersection of Hagar and Coolidge drives, part of the Student Housing West project. Such is the case with Student Housing West, a proposal to build 3,000 beds on campus as part of a systemwide initiative to add 14,000 more beds across the University of California by 2020. 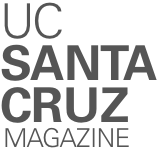 The UC Santa Cruz project, a public-private partnership, was announced in December 2016. The Santa Cruz project, currently proposed for two sites, would be for upper-division undergraduates, graduate students, and students with families. As imagined, the bulk of the project would go up at the current site of Family Student Housing on Heller Drive, with Family Student Housing moving to a small area at the base of the East Meadow, at Hagar and Coolidge drives. That site would also include a new childcare facility for the children of campus faculty, staff, and students. UC Santa Cruz currently houses about 53 percent of its undergraduates on campus, a greater percentage than any other UC, but the campus would like to add more to help students forced to navigate one of the least affordable housing markets in the nation. UC Santa Cruz had hoped to start development on the Hagar site this past summer, aiming for occupancy in fall 2019. But because of the wide range of opinions about the development and the spirited debate, campus leaders extended the comment period and held additional meetings to allow more discussion about the project and possible alternatives. The campus released a revised draft environmental impact report in mid-September for a 45-day public comment and review period. For the latest updates and information, visit ucsc.edu/shw.